McAllister Glacier is one of the main headwaters glaciers of Thunder Creek feeding into the Skagit River in the North Cascades of Washington. 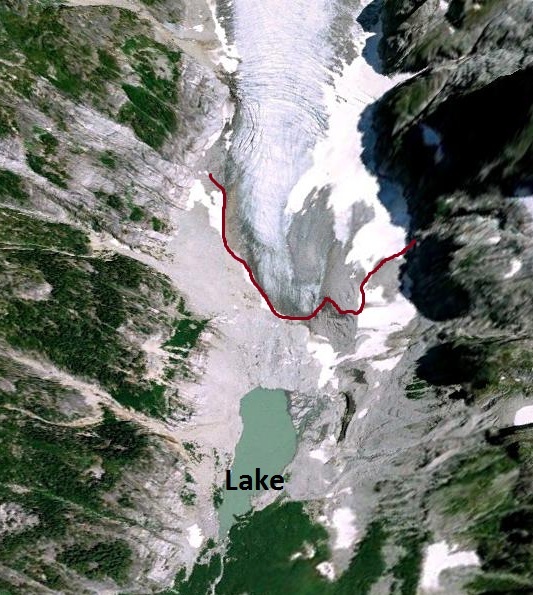 The North Cascade Glacier Climate Project has examined North Cascade glaciers each summer for 28 years and found all 47 that we visit are retreating and six have disappeared. McAllister Glacier is not a glacier we access. This glacier advanced during the 1950-1979 period. 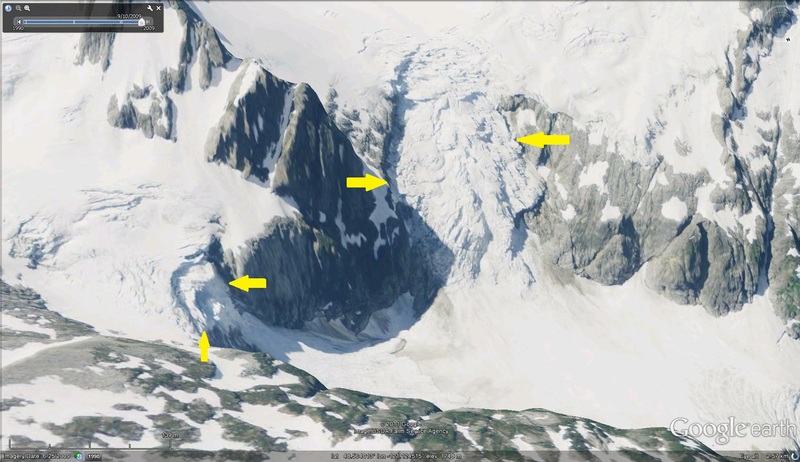 This post examines the changes in this glacier since the 1970’s. 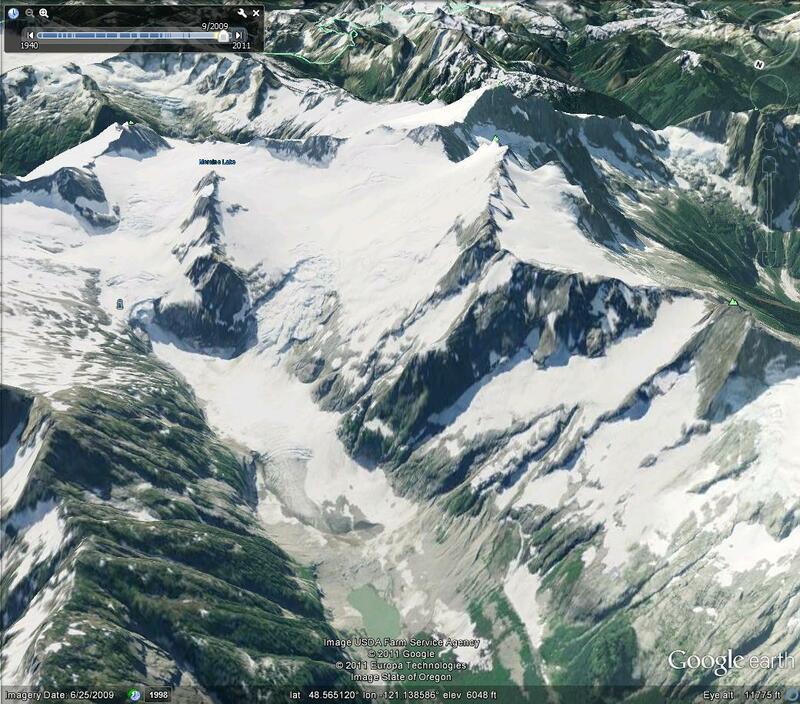 The terminus of this glacier is very hard to reach, and almost as hard to see except from the air. The glacier has an accumulation zone extending from to 2000 meters in two basins, each basin then descends an icefall to 1600 meters, the terminus tongue than extends down valley to the current terminus at 1300 meters. 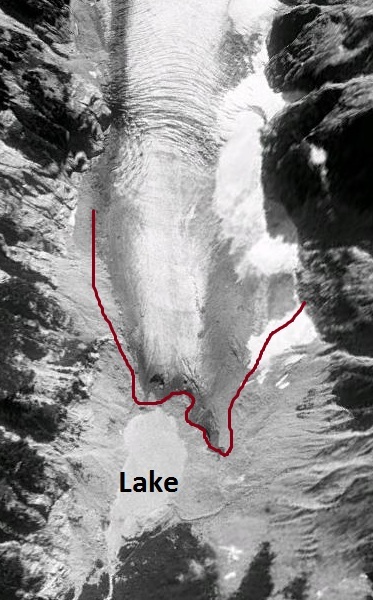 In the 1975 vertical aerial photograph from Austin Post, USGS the terminus tongue is heavily crevassed, burgundy arrow, and the glacier ends in the middle of a small lake. The terminus at that point outlined in burgundy has pulled back a bit from the advance moraine of 1972 in orange. 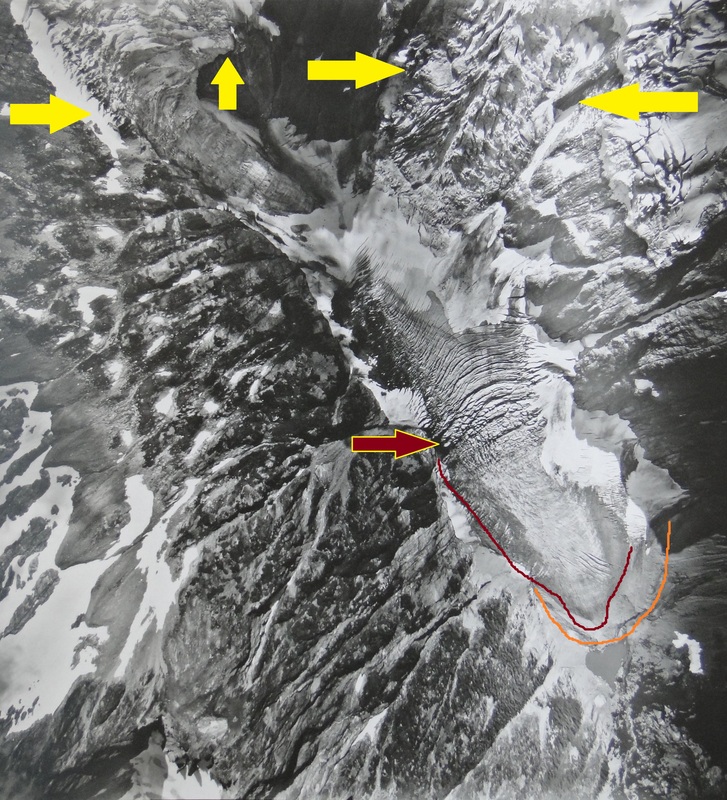 The southern icefall, on right, is extremely active with dramatic crevassing. . By 1998 the glacier has retreated 170 meters to the north end of the expanding lake and the terminus tongue still has less but significant crevassing. In 1998 were able to observe the glacier from nearby Snowfield Peak, the snowline on the glacier was well above the top of the icefall, first image below. By 2006 the glacier had retreated another 180 meters, the terminus tongue has even less crevassing than in 1998, middle image below. In 2009 (bottom image in sequence) the glacier has retreated another 60 meters, making a total 1975-2009 retreat of 410 meters. This retreat is very similar to the retreat observed on Mount Baker, North Cascade glaciers: Boulder Glacier, and Rainbow Glacier, Mazama Glacieras well as on nearby Boston Glacier. The terminus tongues now has very limited crevassing indicating the reduction in velocity due to less ice being contributed via the icefalls. 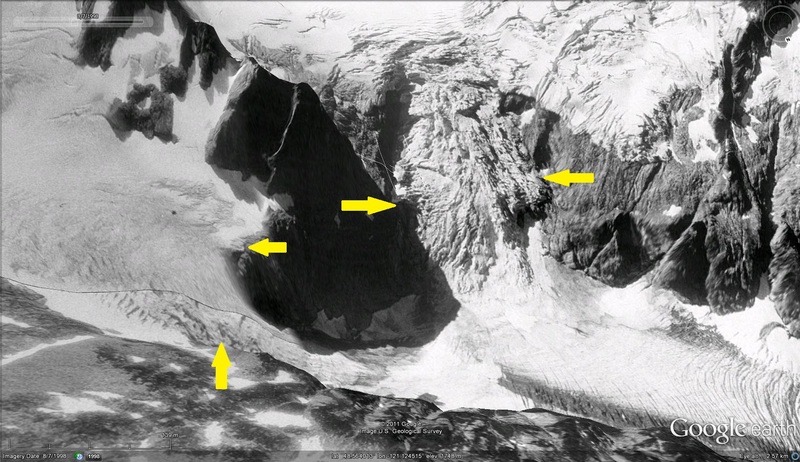 A more detailed look at the icefall from 1975, 1998 and 2009 indicate the changes. In 2009 the northern arm looks to almost end at the top of the icefall the southern arm is much reduced in width and crevassing. At the bottom we return to the 1975 view of the icefall when velocity and crevassing was higher transporting a greater ice volume to the valley tongue. 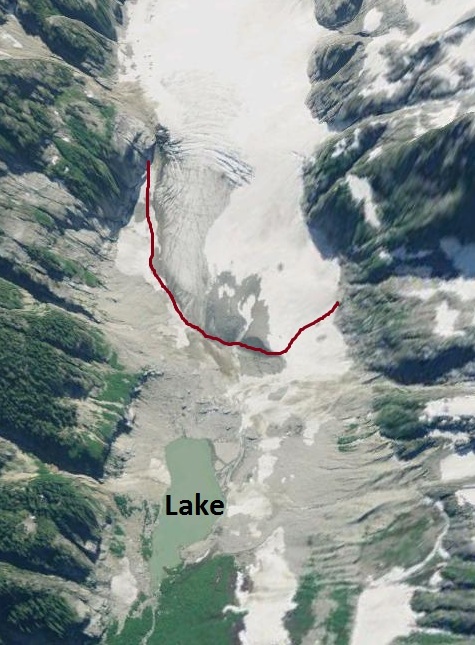 This entry was posted in Glacier Observations and tagged mcallister glacier melt, mcallister glacier retreat, north cascade glacier retreat. Bookmark the permalink.